She was born in Algeria but Canada has very much been home since the tender age of four. I first met Sahar when she moved from Regina to Saskatoon three years ago to study regional and urban planning at the University of Saskatchewan. When I met Sahar I knew that she had the precious and rare qualities that are the making of a lifelong friend. She is passionate about her field of study and has been involved in activities related to it at university. Outside of her studies, I have personally worked with Sahar in planning youth events aimed to bringing together young Muslim girls from diverse cultural backgrounds. Regardless of the nature of the project she is pursuing, Sahar always brings a genuine interest to the cause, a passionate seriousness and a curiosity that inspires admiration of those around her. Her quiet nature is instilled with rare confidence and maturity that will add to whatever project she pursues in the future. 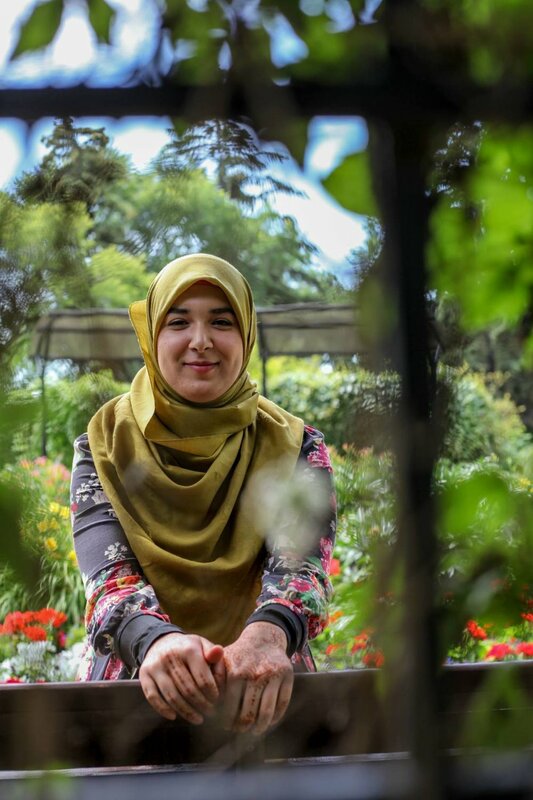 Having recently finished her degree and moved back to Regina she is now starting a new chapter in her life which is always a good cause for reflection and a good reason for this interview- so it gives me immense pleasure to introduce my dear friend Sahar Khelifa. KC: What kinds of projects are you involved in right now? I’m in an interesting place in my life right now; I am sort planning the rest of my life so I guess that makes me involved in a lot of things! Grad school research and applications, job hunting, reading, writing, and art making. I am especially excited about an art project I am working on right now making collages out of pressed flowers and plants I collected over the years. KC: What’s your day job? What do you like about it? What’s challenging? Being an unemployed recent graduate, like all jobs, has its ups and downs ;) Having a lot of time to think about what you want for your future and literally having all the time in the world to do whatever you want is great. Not succumbing to laziness and boredom is the biggest challenge. KC: What’s important to you? There are several things: my religion, spirituality, family, knowledge, nature, volunteering, activism, peace. KC: What do you like most/least about Regina? Regina is where I grew up so the community and memories I have here are important to me, as well as the beautiful prairie landscapes. I very much dislike Regina’s suburbanity. KC: What is your impression of Saskatoon? On my first visits to Saskatoon, I got a big city feel from the place, probably because of the river and downtown, which are some of my favourite places in the city. My impression has always been that Saskatoon is a beautiful city. KC: How do you survive the winters? One of my favourite quotes of all time goes something like this, “There is no such thing as bad weather, just bad clothing.” Warm clothing and positive thinking get me through the tougher, longer, crueler Saskatchewan winters. From the Proust Questionnaire: Who is your hero of fiction? Katniss Everdeen from the Hunger Games, for her fearlessness and resolve to always do what’s right.